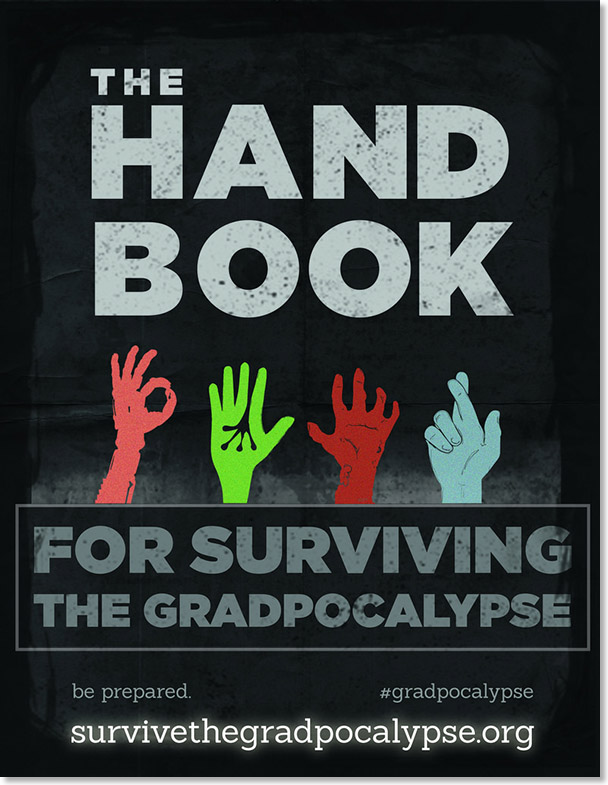 DePaul students, faculty and staff will be tweeting with the hashtag #Gradpocalypse. Text SURVIVE to +1 312-756-7274 to join. Is Grad School Right for Me? Purpose: Official recruiting tool for Kellstadt. Job/Internship postings, events, resume books, etc. specifically targeting Kellstadt students/alumni. 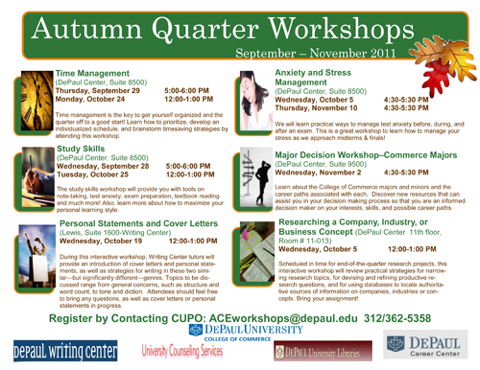 The Writing Center, the University Libraries, the University Counseling Services Center, and the Career Center at DePaul University have collaborated to offer a variety of ACE (Actively Choosing Education) workshops for Commerce students this quarter. Time management is the key to get yourself organized and the quarter off to a good start! Learn how to prioritize, develop an individualized schedule, and brainstorm timesaving strategies by attending this workshop. The study skills workshop will provide you with tools on note-taking, test anxiety, exam preparation, textbook reading and much more! Also, learn more about how to maximize your personal learning style. During this interactive workshop, Writing Center tutors will provide an introduction of cover letters and personal statements, as well as strategies for writing in these two similar—but significantly different—genres. Topics to be dis-cussed range from general concerns, such as structure and word count, to tone and diction. Attendees should feel free to bring any questions, as well as cover letters or personal statements in progress. We will learn practical ways to manage test anxiety before, during, and after an exam. This is a great workshop to learn how to manage your stress as we approach midterms & finals! Learn about the College of Commerce majors and minors and the career paths associated with each. Discover new resources that can assist you in your decision making process so that you are an informed decision maker on your interests, skills, and possible career paths. Scheduled in time for end-of-the-quarter research projects, this interactive workshop will review practical strategies for narrow-ing research topics, for devising and refining productive re-search questions, and for using databases to locate authoritative sources of information on companies, industries or concepts. Bring your assignment!